My passion is liberating the creative soul. As a contemporary Renaissance woman, this expresses through many methods and mediums, like the facets of a jewel. 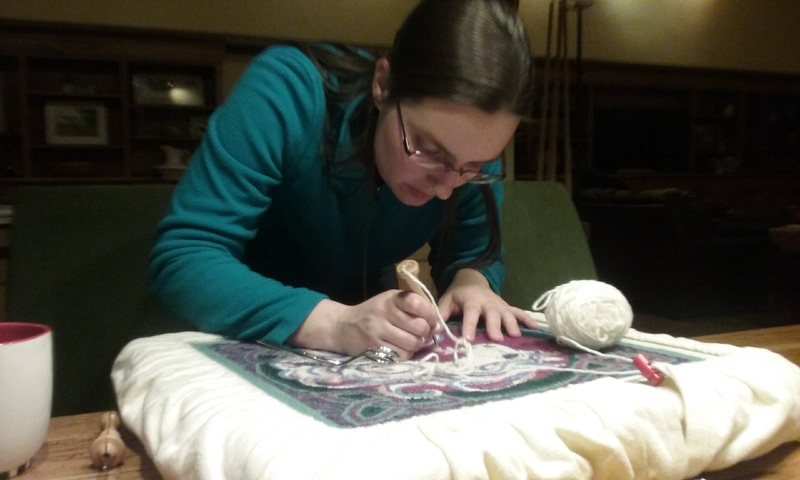 There is no end to the magic of creating with our hands, and the time-honored realm of fiber arts feels especially magical to me as an artist. 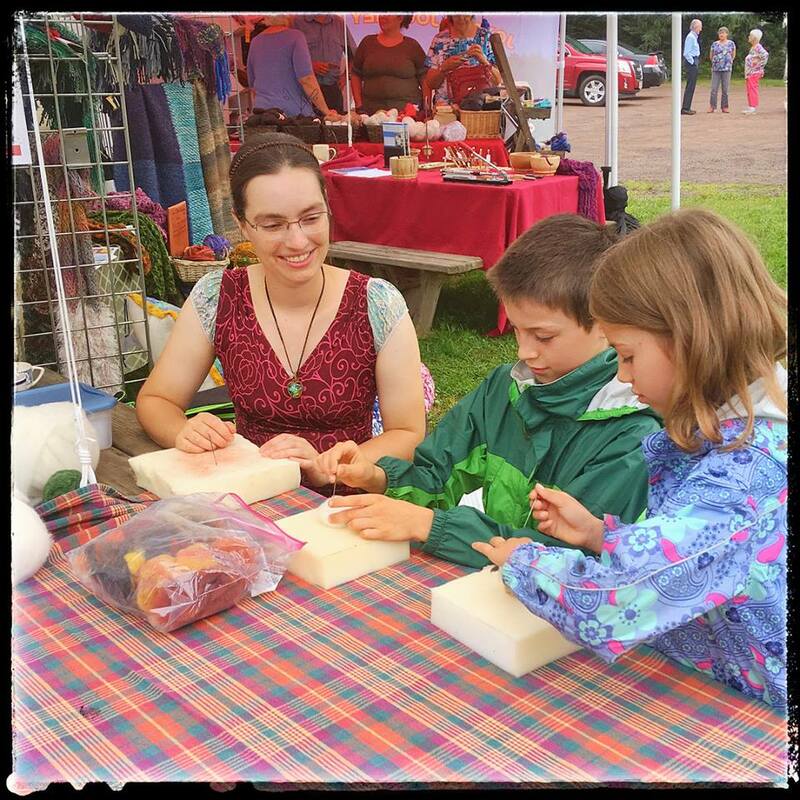 Whether it is transforming wool roving from our farm’s sheep into adorable felted creatures or turning colorful yarns into intricate tapestries, the magic continually renews in my own practice and through teaching others. Erindale Tapestry Studio is grounded on my family’s century farm in northern Wisconsin—tucked within the boundaries of the Chequamegon National Forest. My home studio is a 16-foot diameter yurt nestled on the farm, looking out over the gardens and orchards. But as many artists know, the world is really your studio, and projects come with me wherever I go—whether it’s a cabled crochet piece in my shoulder bag, a sketchbook under my arm, or my latest writing journal on the side table. My family is amazingly patient as projects tend to take over the house as well! Creating is a deep part of my life, and I cannot imagine feeling fully supported to make ideas manifest without piles of yarn and closets full of fabric. The stash is, after all, part and parcel to the process. With 15 looms plus a number of frames, hook, and other hand tools, the possibilities for expressions in fibers are nearly endless. I began the journey at least by age eight, when my mother taught me how to use a crochet hook to make blankets for my favorite stuffed animals. At 13, I began training in Navajo tapestry weaving with master weaver Fran Potter, which is about the same time I began earnestly working in costumery. In 2011, I completed my Masters of Fine Arts in Interdisciplinary Arts at Goddard College, interweaving my love of narrative with my fiber arts and music practices. Currently, I am establishing a small weaving school—enabling a haven for immersive learning in hand skills that are quickly disappearing in an age of machines. These machines (mechanical or digitized) will never replace the magic of creating with one’s own hands, and I am fully engaged in keeping that magic alive—both in my own practice and with students. I am also actively coaching artists in the process of unleashing their creativity. Inspired by Julia Cameron’s “The Artist’s Way,” with influences from Natalie Goldberg, Mark Coleman, and others, this is a powerful process for breaking through blocks and self-doubt to a place of creative abundance—a place filled with life and possibility, empowerment and expression. I hope that you will come to feel a sense of creativity’s magic as well, whether through this site, my finished pieces, or learning opportunities. Every element is interwoven with compassion for details and deep questions of meaning making and the overlay of form and narrative. My hope is that you too will be inspired to engage in the journey of liberating the creative soul. BA in Creative Writing and Performing Arts, Vermont College of Union Institute and University (2008).